If you are taking advantage of all of the distributors that we integrate with, the Aftermarket PSS Catalog contains roughly 400,000 unique products at any given time. When you are starting from the beginning it can seem like a huge task to begin listing products. After all, where do you begin? We recommend taking a brand-by-brand approach to start with while utilizing the robust filtering options that PSS provides on the left-hand navigation menu within the catalog. Manufacturer Group, Price and eBay Listing Status, should all be filters that you begin using on day one. When products exist from multiple distributors you only need to choose a SKU from one distributor, PSS will automatically pull inventory from other distributors for you into that one listing. If a product is available from WP, TR, and PU; simply create the listing for the WP SKU then the TR and PU SKUs will be included as "Listed" in subsequent searches as well. There is no harm in listing all SKUs for a single product. PSS will sort them out and ensure that there are no duplicate listings. GTE refers to the Minimum and LTE refers to the Maximum. Use these filters to make sure that you are working with the product that is above your Minimum Price Threshold. This filter also helps to drill down to a more precise product range and weed out any expensive product. To begin with, just use the Broad Search options at the bottom of this drop down. Select eBay Listing Status Unlisted. You should ALWAYS use this filter when you are trying to create brand new listings; it will ensure that you are not doubling up on any work and always working with the unlisted product. There are two types of listings that PSS allows you to create; Individual Listings and Multi-Variation Listings. Most of the hard parts & accessories that you will list need to be listed individually; one product on one listing. The reason for this is that eBay does not allow variation listings for the majority of hard parts. On the other hand, helmets, apparel, footwear, eyewear, etc. can and should be created in the Multi Variation format. Variation listings are the ones that you see on eBay with drop-down selectors for different colors, sizes, and options. Let us now go create some individual hard part listings from the PSS Catalog using the logic outlined above. We will cover Variation Listings later in this article. Once the results come up you can decide if you want to list all Plastic Kits in this search result or just some. eBay Listing Template - Select the listing template that you wish to use for this listing or batch of listings. This will create valid listings but they are not very unique. 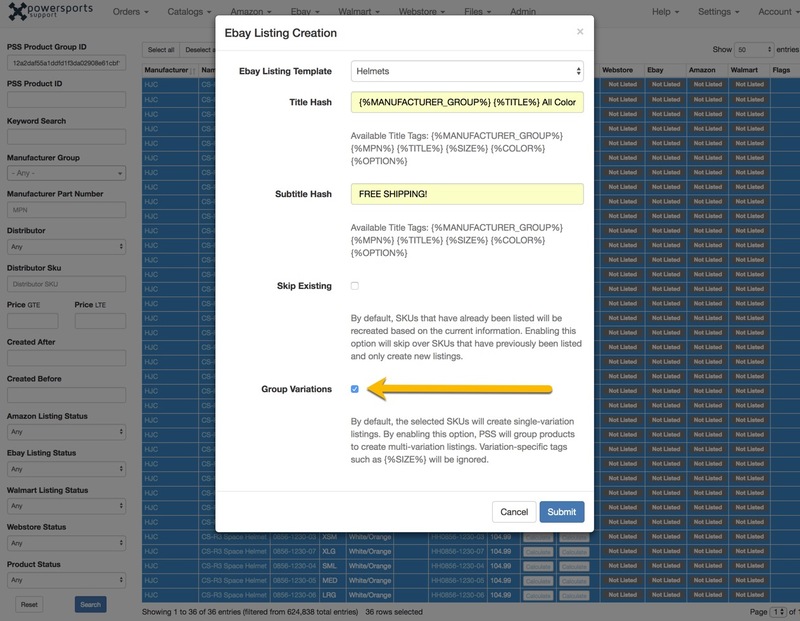 It is recommended to use a combination of the tags and your own keywords to enhance the listing titles. 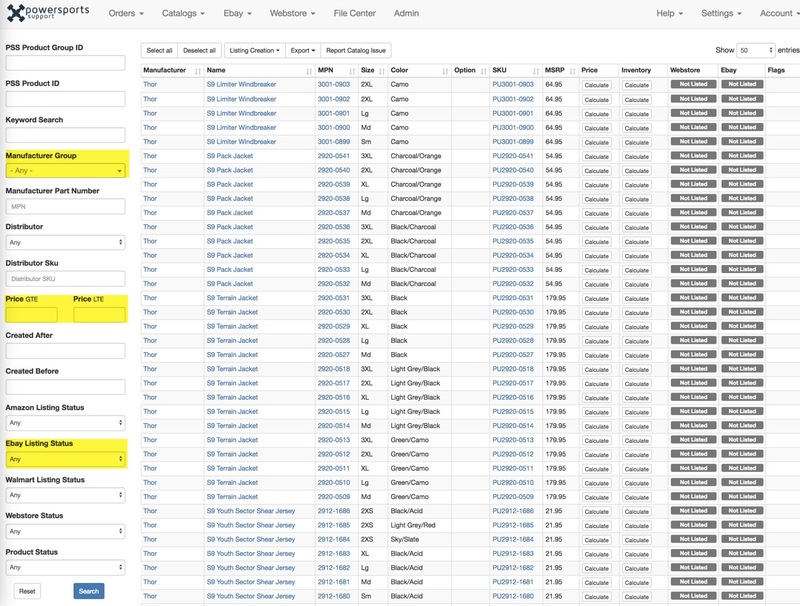 The more specific you are with search and selection of products, the more you will be able to accurately augment the catalog data with your own keywords to help ensure unique, searchable titles. Subtitle Hash - If you are in the eBay VIP program you will likely want to take advantage of the free subtitles. These subtitles simply add a little extra notation to your listing and make it stand out. Free Shipping!, Authorized Dealer! or New for 2019!, are all examples of a common subtitle. You may also use the tags in this area should you desire. Skip Existing - This box is unchecked by default. If you proceed with the box unchecked you would relist any currently listed products. If you checked the box and attempted to relist any product that you had already listed, the new listings would not be created. 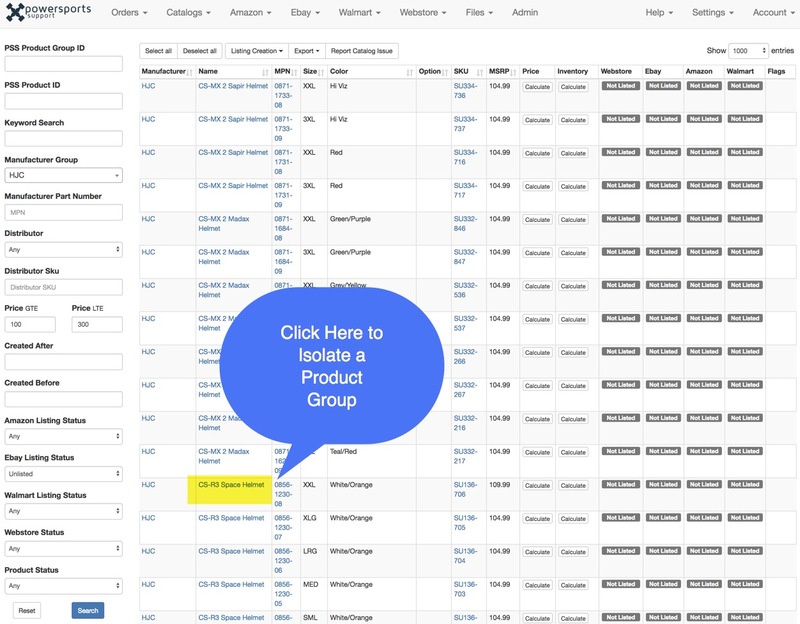 Group Variations - When listing hard parts or any product that you want individually listed (1 MPN; 1 Listing), you want to leave this box NOT CHECKED. Once you have all fields appropriately filled out you may click the Submit button. Then make sure to click the "Close" button when it pops up. This completes the creation process; these listings will be sent to eBay in the next scheduled listing creation feed. Variations allow you to group products together and allow shoppers on eBay to select the color, size, option from the listing. Variations are not available in all categories and are restricted to products without fitment. 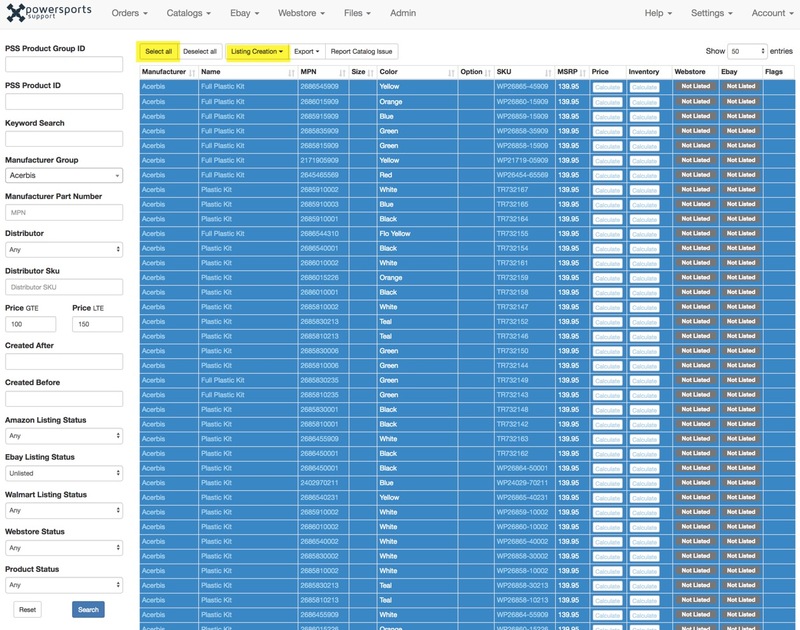 You should target helmets, apparel and other items with color, size attributes for variation listings. Variations are valuable for a few reasons, if you are not in the VIP Program you can consolidate multiple SKUs into a single listing to save on insertion fees. 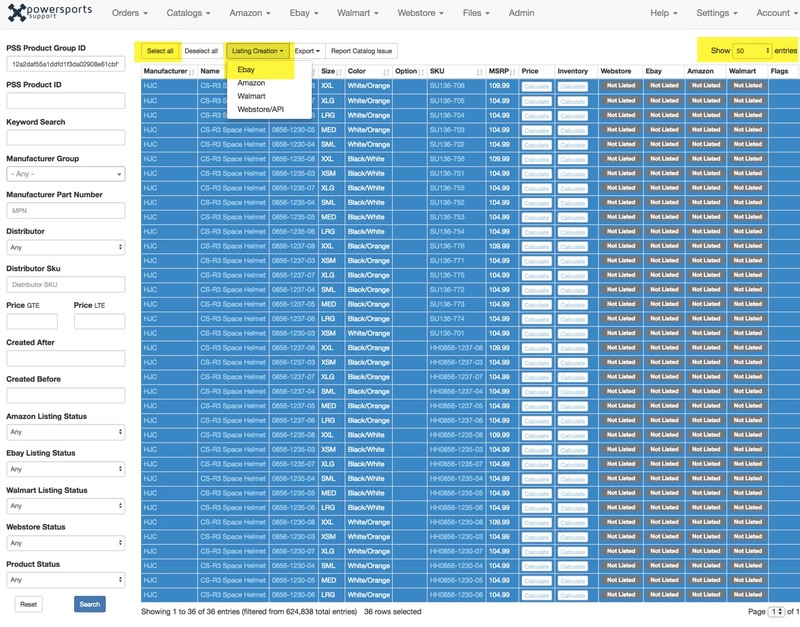 The sales history is also grouped together for variation listings. If you have a Helmet listing that has 5 colors and 6 sizes, that represents 60 SKU's on the listing. If a Black Small sells, the entire listing gets a bump up in eBay search results, then if a White Large sell the listing bumps up again. You are aggregating the sales history for multiple SKUs in the listing resulting in higher search resolution. Once you have the results from the above search you will want to isolate a product group. Let us list all of the HJC CS-R3 Space Helmets onto one variation listing. Click on the Product Group Name which is listed in blue. This will bring up all variations of the group. 2. From here just Select All and click the Listing Creation > eBay button. Make sure that you show enough products to accommodate the size of the product group. Some of these product groups will have over 100 variants so you will want to show enough entries. Show 25-500 should suffice. Title Hash - For the title, we are going to want one title that describes the entire product group. The MPN tag cannot be used here since we are representing multiple MPNs on the listing. All Colors & Sizes or something along those lines will typically be used. Subtitle Hash - If you are in the eBay VIP program you will likely want to take advantage of the free subtitles. These subtitles simply add a little extra notation to your listing and make it stand out. Free Shipping!, Authorized Dealer! or New for 2019! are all examples of a common subtitle. You may also use the tags in this area should you desire. Note: Subtitle length limited to 55 characters! Do NOT use all of the available tags for subtitles as they will likely error out. Group Variations - When creating these variation listings you MUST check the Group Variation box. Otherwise, you would create several listings with the same title. Variation Listings; box CHECKED.